A personal assessment of BMW’s MINI remaster. If Cool Britannia was a car. Image uncredited. There’s always been a faint whiff of the tribute band about Oasis, a nagging sense that it was all somewhat better the first time around. Similarly, despite the overwhelmingly positive reviews and its promising technical specification, I came to BMW’s R50 MINI with a sizeable chunk of ambivalence. However, owing to frequent use of a 2006 MINI Cooper on regular visits home to Ireland, it’s a car I have come to know well, so has more intimate acquaintance with BMW-Rover’s retro recasting brought about an acquiescent change of heart? It’s important to note that cool Britannia MINI is no ‘charwoman’s car’ as ur-Mini architect, Sir Alec Issigonis originally defined it. Millennium-MINI is a sports car masquerading as hatchback, and as such doesn’t so much nudge you in the ribs, as whack you over the head with its Lads-mag, ‘Cigarettes and Alcohol’, persona. It is therefore written in the statute books of most civilised nations that it is only possible to drive an R50 in ‘mad for it’ mode. Anything less is heresy, possibly punishable by law. Hurling Britpop-MINI down twisting, undulating Irish backroads is, I have to admit, one of life’s more amusing pastimes. The engine is a 1.6 litre unit, sourced from Chrysler. Neither tending to travel with a fifth wheel to hand, nor having unrestricted access to the Milbrook proving ground, I was not prepared (or all that interested, if honest) in obtaining performance figures, but thanks to the kind people at Autocar, I can tell you it develops 116 bhp and accelerates to 60 in 9.3 seconds. Spirited acceleration elicits a pleasing induction roar, but like Noel Gallagher in full-on mardy strop, the performance doesn’t quite add up to the noise level. Autocar recorded a tardy 30-50 mph time of 9.7 seconds, betraying a rather breathless powerplant with little reward for explorations of the upper reaches of its revolutionary envelope. At sane cornering velocities, ‘roll with it’ MINI remains pleasantly neutral, the meaty (electrically assisted) steering linear and sharp-witted, if lacking any meaningful feedback. At speed, the steering, beefy Getrag gearshift and stiff suspension work in concert with the driver, encouraging spirited driving. Only rank stupidity will unsettle the car mid-corner – lifting off can nudge the tail out, but is easily and swiftly corrected. 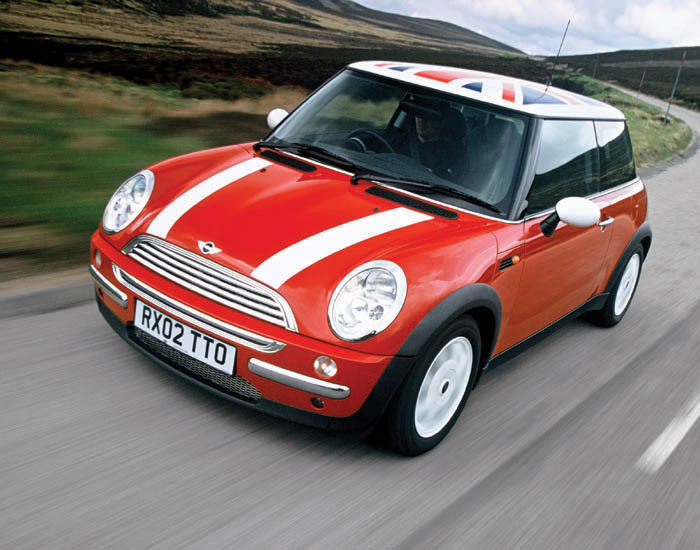 The Cooper feels planted, faithful and predictable – a car to take out and drive the union jack pants off. Yet, while its B-road handling is beyond reproach, it lacks a certain finesse. In maximum attack mode, the MINI’s ride quality is something you can overlook. Most of the time however, it’s simply punishing. Unlike the original car, which also bounced and pitched like a hyperactive bunny, ‘supersonic’-mini has steel springs and conventional dampers plus (one imagines) provision for adequate wheel travel. On pockmarked Irish road surfaces, it crashes and jars. Road induced tyre roar is also wearingly high. Owing to the low roofline and thick pillars, the Cooper’s cabin feels claustrophobic. The window area is narrow and slot-like, the all-black interior trim adding to the sense of gloomy confinement. The front compartment offers adequate leg and shoulder room for larger folk, but the rears are useless – making it in effect a two-seater. The steering wheel is well sited, but doesn’t adjust for reach or rake, a disappointing omission in a sporty car. The wheel rim is far too thick. Despite this, it’s an easy car to handle, with compact dimensions and easily determined extremities. In the wet however, the swept area of the shallow windscreen leaves large blind-spots while mud and road gunk flung onto the rear screen quickly reduces rearward visibility. Fortunately, the sizeable door mirrors are excellent. The boot will easily carry several decent sized parcels. Controls are generally well placed and easily learned, but come with a dash of counter-intuitive whimsy. The centrally mounted instruments for example (rev-counter aside) are a retro-inspired nod to the original car, but force the driver’s eyes off the road. Similarly, the attractive looking row of toggle switches are confusing and impossible to operate accurately by feel, even with practice. Fortunately, they don’t control anything of note. Two column mounted stalks control wipers, indicators, headlamp flash/dip and despite their somewhat Flash Gordon appearance, work well. The dipped headlights however are staggeringly poor. Standard-fit spotlamps (themselves no paragon) are essential for confident night driving. The Cooper is commendably well made and finished. While some of the interior plastics are a little cheap feeling by contemporary standards, everything fits well and has remained steadfastly in place and largely rattle-free despite the pummelling it has withstood on brittle West Cork roads. Over eight years there has been one or two mechanical maladies, but on balance it has proven a reliable and durable little steed. The MINI is a friendly car and if you’re in the mood, terrific fun. View it as an inexpensive sportscar and it won’t disappoint. On brief acquaintance, it’s easy to be won over by its charm, taut handling and amusing demeanour, especially over challenging roads. However, when you’re just trying to get somewhere with the least fuss the R50 becomes a bit of a chore. Too uncomfortable, too cramped, too downright hyperactive. Its limited interior space, stiff ride, tiny boot and poor visibility seriously limit its everyday usefulness. I know. It’s possibly my fault for failing to succumb to ‘Wonder-wall’ MINI’s obvious charms. After all, its owner adores it. It is also somewhat churlish to criticise BMW/Rover for producing such a driver-focused, technically dense machine when they could have opted to offer something a good deal more cynical. But one can’t help sensing an element of contrivance in the R50’s makeup. The Issigonis Mini was a bit of a laugh, but at heart was a deeply serious motorcar. Britpop-MINI isn’t anywhere serious enough and that goes to the heart of my ambivalence towards it. Oasis had a couple of decent tunes and maybe one good album – their first. But behind the posturing, there was a nagging lack of substance about them as successive album releases became more bloated and derivative. Similarly, while BMW got the R50 Cooper recipe pretty much right first time, they appear to have dropped the baton through subsequent iterations. So while the MINI may indeed be something of a Champagne Supernova, I find that bubbles tend to give me hiccups. My own take on Oasis was that Liam Gallagher looked too much to the right sort of people for the wrong sort of inspiration. John Lennon’s voice had range and nuance – he could do soft and caring, he could do good-time and he could do angry. Oasis vocals just seemed to capture Lennon’s most angry whinge – effective sometimes but tiresome with over-repetition. So, yes, BMW seemed to read that, as a bi-product of its engineering, the Mini was a great car to throw around, then read no further. If we accept that it’s not really a hot-hatch but a front-wheel-drive sports car disguised as such, which I feel is a perfectly correct observation, then we find it had one significant predecessor. The M100 Lotus Elan had an awful lot of stick in 1989. By clever use of a modified Isuzu drivertrain Lotus produced a car that got unqualified praise of its handling except … oh, it’s front wheel drive. This undeniably contributed significantly to the Elan’s failure – ‘enthusiasts’ just couldn’t take it entirely seriously. By disguising their sports car as a friendly hatchback, BMW cleverly came at it from the other direction and had great success. There’s no justice. I´d forgotten about the Chrysler engine in the Mini. Does anyone know why a Rover unit was not considered? I was only ever once in a Mini and found the packaging deplorable. And before that, I tried a Rover 200 and found the packaging deplorable too. As it happened I had a Peugeot 205 nearby which occupied less road space but had a decent boot and room for two in the back. What was it with Rover and mediocre spatial skills? According to the good folk at AROnline, It was politics. Rover wanted to use their own K- Series engines, but the decision was made in Munich. Their story of the cars development is interesting, one which doesn’t reflect too well on BMW. The 200 was based on a Honda Civic platform originally, which may account for the packaging. In fact, Rover/BL were traditionally very adept in the space efficiency department. I think that BMW were looking for a reason to hook up with Chrysler at the time – possibly even an M&A deal. This engine deal seems to have been the only fruit of this co-operation. The sad thing, of course, is that with a bit of development to the cylinder head gasket, the K Series would have been a perfectly good unit for the MINI. Packaging became an issue for Rover Group Cars as they first became reliant on Honda for donor vehicles, and then BMW seemed to help them contrive a FWD 75 with RWD-a-like packaging restrictions. Not ideal.